There is plenty to do during your stay at Sugar Loaf Lodge. Since we are blissfully unencumbered by television, the internet, or other electronic gadgets, we invite you to share in the joy in the simplicity of the outdoors. There is hiking, fishing in one of our many ponds in our meadow, horseshoes, mule drawn wagon rides, and the ever inviting campfires. There are mountain biking trails located adjacent to our property and 4 wheeler trails within 2 miles. 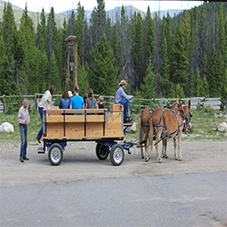 Other activities in close proximity include digging for crystals at Crystal Park, fishing the Big Hole River, golfing at the Old Works golf course, boating at Georgetown Lake, and exploring one of the many ghost towns in the area. 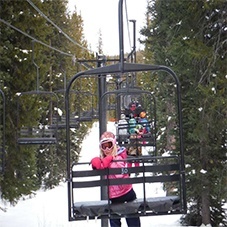 Winter brings the opportunity to down hill ski at Discovery or Lost Trail Powder Mountain, cross-country skiing located next to our property, ice fishing on Georgetown Lake and hundreds of square miles of snowmobiling in the Beaverhead National Forest. And of course, you are always welcome to build a snowman.